My edition: Paperback, published on 30 July 2015 by Harper, 371 pages. Description: Tindledale is in a titter. The Village Show competition is coming around again and after last year’s spectacular failure, the villagers are determined to win. Meg, teacher at the local school, is keen to help and to impose some much-needed order. Did you fall in love with the charming village of Tindledale in The Great Christmas Knit-Off? Or do you have a soft spot for the delightful Carrington's series, also by the hand of brilliant author Alexandra Brown? 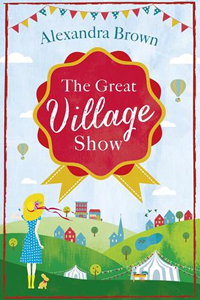 Then The Great Village Show is one book release you absolutely can not miss this summer! And even if you are not yet familiar with Tindledale or Alex's wonderful books... guess what? Her latest novel is a stand-alone so the perfect opportunity to dive into her gorgeous writing and discover a new author that will soon be one of your firm favourites – trust me on that one. Meg is the acting head of the primary school in Tindledale. She adores her job and the children she works with, so when the school is at risk of getting closed down she makes it her mission to stop this from happening. But on top of missing her son Jake – who has just left the parental home for university; getting distracted by a pompous newcomer; and taking on part of the organisation of the annual Great Village Show, will Meg be able to focus on creating an exciting and diverse lesson plan that will convince the inspectors that the village school is an unmissable part of the community? Jessie is new to Tindledale and she hopes that village life will provide a must-needed change for her and her family. Her husband is often away on lengthy business trips overseas, so Jessie is determined to make friends in the village, enrol her four-year-old triplets into the local school and reignite her passion for keeping bees. But the fresh start she's been longing for is easier said than done, and unless things change drastically and she makes some difficult choiches, her life in Tindledale will be just as unhappy as it was back in London. It was such an utter joy to return to the charming town of Tindledale! I fell head over heels in love with this amazing place and its incredible inhabitants in The Great Christmas Knit-Off, and so The Great Village Show felt very much like catching up with an old friend from childhood; someone who you can be your complete self with as they already know everything about you. And because it's about a whole new set of characters – with our favourites from the first book occasionally making cameos – it's a great way for new readers to discover this incredible series as well. Initially I wasn't sure about the focus on Meg and Jessie as I love Sybs, Dr Ben, Basil and Cher so very much, however Alexandra Brown has done it again and created some fantastic characters that you can't help but love and root for from the moment they appear on the page. Alex has a warm and enchanting voice in which she details the story and her settings, and this shines through in her captivating characters as well. They really become the reader's friends over the course of the novel and even though they might get a happy ending, it's almost sad to be turning that final page as it feels like a farewell – and one where you're not sure when you'll have the opportunity to catch up with these friends again in a whole new story (this is a not-so-subtle hint to Alex that I want more Tindledale, please!). The Great Village Show isn't just great, it is wonderful! Incredibly charming and captivating, it's not only the feel-good story within its pages that will delight readers, but it's the lovely characters and the idyllic village of Tindledale as well. Novels like this is what makes reading such an utter pleasure and the perfect escape from the hectic every-day life.